Yellow Octopus is Australia’s wackiest purveyors of novelty gifts, quirky gadgets and toys for little and big kids. It makes a point of scouring the globe for off-beat items to sell online and in its Melbourne-based retail store. Yellow Octopus is a treasure trove of curiosities suitable for men, women and children. Whether you’re looking to buy Christmas stocking fillers, practical jokey birthday presents or you’re simply looking for some fun embellishments for your household - Yellow Octopus gives you everything you could possibly want to add a bit of colour or humour to a space or a special occasion. As the brand name suggests, this merchant is dominated by a larger-than-life mascot character called Olli. His goofy face and tentacles can be seen all over the online store as well as in shopping centres and high streets all over Australia. If you don’t live in the vicinity of the Victoria store, don’t despair - the online shopping experience is just as fun. Get comfy and start browsing through categories such as; Gifts, New, Living, Kitchen, Gadgets, Work and Food. We guarantee that you’ll be laughing all the way to the checkout! How do I use my Yellow Octopus voucher? 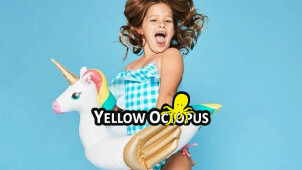 Check out the latest voucher codes for Yellow Octopus listed on vouchercloud. You’ll be redirected to the Yellow Octopus website, then you can start shopping. When ready, go to the ‘cart’. Paste your voucher code in the box, click ‘apply’. Click red ‘Continue to shipping method’ button at the bottom of the page. Shop on the Sales & Clearance pages to pick up some ridiculously good discounts and last minute bargains. Get in there quick, before the best stuff disappears! Does Yellow Octopus offer a price match? It does, you can try and request one by getting in contact here in the first instance. Does Yellow Octopus offer corporate discounts? Yes, businesses who give out corporate gifts from Yellow Octopus will benefit from special bulk-order discounts. Can I read reviews for Yellow Octopus? Yes, there’s a whole page dedicated to reviews here on the website. Yellow Octopus provide you with a free return, replacement or refund if your product is faulty, incorrect, not as described or damaged. If you’re looking for the purveyors of Australia’s quirkiest gifts and gadgets, look no further than Yellow Octopus online. Yellow Octopus scours the globe to bring customers the funnest products suitable for birthdays, Christmas and special occasions. With a Yellow Octopus coupon, you can save some money while stocking up on the most imaginative stocking fillers and gifts to suit the whole family! It’s not all fun and games though, you can get practical products for the home and office too. If you want to keep up with Olli the Octopus’ latest adventures and get all the Yellow Octopus gossip - you should head over to the Blogtopus Blog and immerse yourself in a sea of wacky stories and popular culture trivia. Watch some side-splittingly funny memes, laugh at silly animals in silly costumes and learn about the latest gadgets to grace the shelves of Yellow Octopus’ stock room. There’s a few handy buying guides and Top 50s to help you navigate the overwhelming world of novelty gifts. Yellow Octopus has taken the art of novelty socks to a whole new level, so if you’re after a top notch prank present - you’re sure to find something that’ll give the recipient a giggle every time they take their shoes off. With a Yellow Octopus discount code in your possession, you’ll make some smashing savings when you reach the virtual checkout. Choose from cosy socks adorned with emoji poos, sushi, monsters and a whole host of quirky characters.